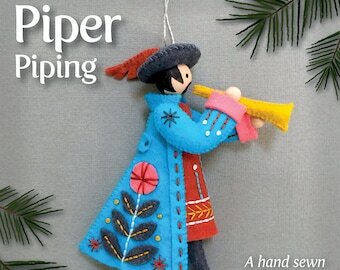 This is a PDF pattern download, not the actual ornament! This does not include materials. Please note: This pattern is written in English. 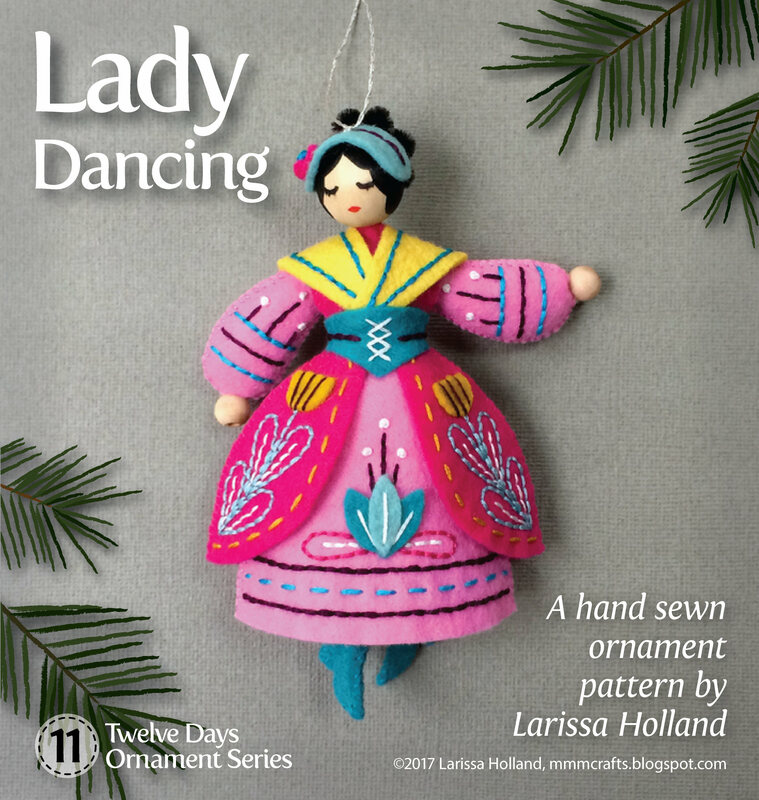 This detailed pattern shows you how to make a colorful, embroidered lady dancing ornament. 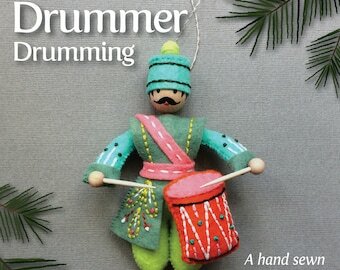 Perfect for your Christmas tree or for special handmade gifting. 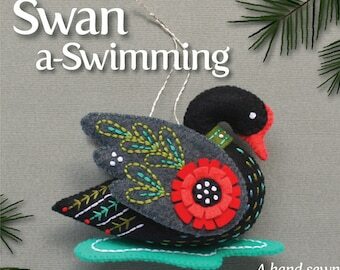 The ornament is sewn entirely by hand. Choose your own colors, or follow my pre-chosen colors of felt and floss (see them here: http://mmmcrafts.blogspot.com/p/twelve-days.html). HOW HARD ARE THESE TO MAKE? If you can do precision cutting, basic hand stitches (running stitch, whipstitch, backstitch and French knot) and are familiar with sewing and embroidery terms, then you can make this project and make it well! HERE'S WHY: this pattern utilizes a Sulky brand water-soluble stabilizer which makes putting the ornament together easy, fast and accurate. The design prints or copies directly on the stabilizer, which is then adhered to the felt, and you embroider right on top of it! Materials used to make this ornament are commonly available. They include: wool or wool-blend felts, cotton pipe cleaners, unfinished wood beads, embroidery floss, stuffing and a Sulky printable stabilizer. A complete list of materials is in the photo of the pattern page above. Click Zoom to read through it. This pattern is in PDF format on 8.5 x 11 inch paper, so you can print it from your regular printer at home on standard paper and printable stabilizer, as many times as you need for personal use. This pattern PDF will be available for INSTANT DOWNLOAD once your payment is completed! 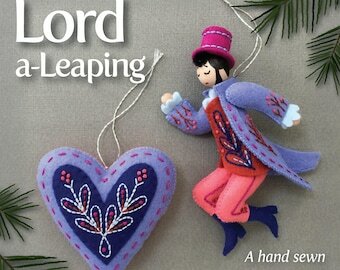 CHECK MY SHOP FOR OTHER ORNAMENTS IN THIS TWELVE DAYS PATTERN SERIES IN DISCOUNTED BUNDLES AS WELL AS SINGLES! NOTE: These decorations have small parts and may present a choking hazard. These are not decorations designed for children under the age of three. COTTAGE INDUSTRY SELLERS: If you are a home sewer, YES, it is OK to make and sell items from this pattern as long as you credit me for the pattern. No mass production allowed. Please check my policies page for details. This pattern is ©2017 Larissa Holland, all rights reserved. Do not distribute or publish any portion of the pattern. Purchasing the pattern does not transfer you the copyright. It is unlawful to copy and resell this pattern. Thanks for respecting the copyright! Excellently clear pattern - definitely get the Fabri-Solvy, that stuff is a revelation! Great pattern. Easy to follow. Once everything is cut and embroidery done, it comes together quite quickly. Payment is accepted from all major credit cards or Paypal at checkout. Etsy gift cards are also welcome! I want you to feel completely happy with your purchase. If there is a problem, please do contact me via Etsy convo. I'm a nice person and I'd love to help. I will gladly cancel and refund a transaction if shipping/downloading has not taken place. I cannot offer refunds on shipped goods or downloaded digital files. I'd be very happy to answer your questions before you buy. If you are a home sewer and have a cottage industry personally making things with your own little hands and selling them to your friends, in a craft booth or personal online shop (read: no mass production), you can purchase my patterns for that purpose, with my blessing. - A reminder that the copyright on my patterns still stands: That is, you may not copy, resell, share, distribute or publish (online or otherwise) any portion of any of my patterns without prior permission from me. Period. Basically anything that involves sharing any part of my patterns with anyone else is a no-no. 8 Mikey Monkeys + 12 Christmas Ornaments = limit of 20. If you are selling something as a set under one listing (like ornaments) that would count as one item. - Include credit where it's due. Please list a credit for the pattern on each listing or on each hang tag for the item: Pattern by Larissa Holland, mmmcrafts.blogspot.com or something like that. - Minor derivatives are ok, but even if you make changes in the way a pattern is made, please still give a credit to me for the pattern, along with a note that it is a variation. - PLEASE NOTE that it is really really really NOT OK to use any of my photos, images, logos, badges, or graphics to promote your site or booth on signs, flyers, tags, headers, etc... Don't do it! Those images are copyrighted. Judging from the number of requests I get, there are a lot of readers out there who don't have the time or inclination to sew for themselves and they would appreciate knowing where to find your MmmCrafts handmade items. Let's get you two together! Send me a link to your shop so I can place it on the Mmmakers page on my blog so folks will know where to find you and buy your MmmCrafts stuff. 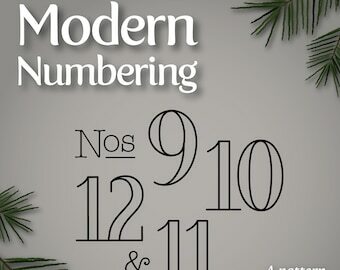 Questions about the Twelve Days Ornament Series? I include sizing details in the individual pattern listings, but they may not be in the bundled listings. The average size for the Twelve Days Christmas ornaments is about 4 x 5 inches. It varies of course, because the shapes vary a good bit. I do not offer wholesale printed patterns at this time. It’s on my to do list! 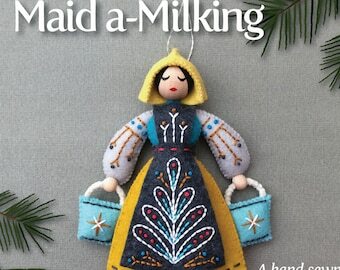 I do offer 20% bulk discount for 10+ patterns to stores if you wish to offer classes. Just convo me with your store details to get started. How do I give a pattern as a gift? Because my patterns are downloads, and are not emailed, it’s best to give an Etsy gift card along with a link to my shop. That way your friend can choose a gift and download it from their own Etsy account (which is free and easy to create). Purchased patterns are backed up at Etsy for them and available anytime in case of computer crashes, lightning strikes, or toddlers with peanutbuttery hands. The links do not expire. How do I find my download? If you purchase either with your account or as a guest, Etsy sends a purchase receipt with links to your patterns to the email address you entered. You can use the email links to download your pattern. If you purchased with your Etsy account, you can also always find your patterns under You > Purchases and Reviews. The links do not expire.